Keep the context in mind remembering that in Isaiah 1-39 the message is primarily one of condemnation and that Isaiah 1-12 is directed to Judah and Jerusalem. vision, conversion, self-judgment, cleansing, self-surrender, communion, commission, intercession. This vision is the glory of Christ (John 12:41). The fulfillment of the hardening judgment of the nation, the blinding of their eyes did not set in completely in Isaiah's day. Study carefully Matt. 13:14, 15; John 12:39, 40, 41; Acts 28:25, 26, 27. However, Israel's blindness is not permanent. The year of King Uzziah's death (see similar dating Isa 14:28) (~ 740 or 739BC) (2Ki 15:1-7 where Uzziah = Azariah, 2Chr 26:1-23) Under Uzziah's 52 year reign Judah experienced prosperity (a "golden age") and power (cp 2Chr 26:8) during a time when Assyria was still weak. Uzziah was generally a good king (2Ki 15:3, 2Chr 26:8) but was struck with leprosy when he entered the Temple of the LORD (2Ki 15:5, 2Chr 26:16, 17, 18, 19, 20, 21) which led to his isolation as a leper for about the last 15 years of his life until his death (2Ki 15:7). In about 745BC, five years prior to Uzziah's death, Assyria began to emerge as a new international power under Tiglath-Pileser (745-727BC) while Jotham was king (2Ki 15:19). Most (Wiersbe, MacArthur, Motyer, et al) but not all conservative commentators feel that Isaiah 6 marks the inaugural call of Isaiah into the prophetic ministry and that chapters 1-5 were actually written after his call which would place Isaiah 6 out of chronological order. Others (like Gary Smith, New American Commentary series) argue for Isaiah 6 as special "recommissioning for a new task". The interested reader is referred to other resources for more in depth discussion (Smith: New American Commentary, Oswalt: The New International Commentary). The approach of these notes is to accept Isaiah 6 as the prophet's call into ministry. I saw the Lord sitting on a throne - How? In a vision? The text is silent. He saw Jehovah which is enough to know. To argue over how he saw Him is to miss the splendor of this scene. Before Isaiah is sent to preach to the sinful and rebellious nation, the majesty, greatness, and holiness of God is revealed to him. Who did Isaiah see? Comparing this text with Jn 12:41 (discussed below), it is clear that Isaiah saw Jesus, Who is Jehovah of the OT. In Jn 8:58 He declared that He was "I Am", the name ascribed to God in Ex 3:14. It was Jesus Who Moses experienced in the burning bush. Verse 1 says that Isaiah saw the Lord. How this could be is not indicated. There are many verses in the Bible which teach that God is invisible and cannot be seen. “No man can see Me and live!” (Exod. 33:20). “No man has seen God at any time” (John 1:18). In fact Paul says that God “dwells in unapproachable light; whom no man has seen or can see” (1 Tim. 6:16). “God is spirit” (John 4:24). Yet Isaiah saw the Lord and many others in the Bible are said to have seen God. Jacob said, “I have seen God face to face” (Gen. 32:30). The Lord Jesus even said, “Blessed are the pure in heart, for they shall see God” (Matt. 5:8). “Behold, he cometh with clouds; and every eye shall see him, and they also which pierced him” (Revelation 1:7). This judgment by Christ is by our apostle proved from an Old Testament prophecy which certainly refers to Jehovah himself. Read Isaiah 45:23, and learn from it that our Lord Jesus is Jehovah, and let us joyfully adore Him as our Savior and God, to Whom be glory for ever and ever. The Lord with the sound of a trumpet. Jesus is Jehovah. The joyful strain of the trumpet betokens the splendor of his triumph, leading captivity captive, and well might the clarions ring out the tidings of Emmanuel’s victorious return. indicates the truth that God is the owner of each member of the human family, and that He consequently claims the unrestricted obedience of all… The claim upon man's service which is set forth in the title Adonai is well illustrated by Mal 1:6, where Jehovah says, "A son honors his father, and a servant his master (or masters); if, then, I be a father, where is mine honour? and if I be a master (Adonim), where is my reverential fear?" Adonai is the exalted, majestic sovereign, the One Who has the right to call Isaiah into ministry so that His sovereign rights as Master and Owner over Israel might be proclaimed (Isa 1:3 "an ox knows its owner"). The Master has a right to expect obedience. In Old Testament times, slaves were the absolute possession of their master and had no rights of their own. Their main objective was to fulfill the wishes of their master. Slaves had a relationship and responsibilities that were different from that of hired servants. For example, hired servants could quit if they did not like the orders of their master. In contrast, slaves had no other option but to obey their master (see, for example, Ge 24:1–12). The call of Moses serves as another illustration. His hesitation to obey the call of God eventually ended when he acknowledged God as Adonai, or Lord (Ex 4:10, 11-18). When Moses admitted his position as a slave and God’s position as the Lord—the Master—there was only one viable option—to obey. When Moses called God Adonai, he acknowledged that it was not his place as the slave to choose his work; he had to heed his Master’s directives. "Whom shall I send and who will go for us?" This call for service comes from Adonai, for this is the name used in Isaiah 6:8. So prophet after prophet is called and commissioned for service by Adonai, the Lord who claims obedience and service. The shrinking Jeremiah, ordained from before his birth to be a prophet, answers the call to service by saying, somewhat like Moses: "Ah, Adonai Jehovah! Behold, I cannot speak: for I am a child" (Jer 1:6). Lofty (07311) (ruwm) is a primary root which conveys three ideas (1) literal height, (2) height symbolic of notions (glory, exaltation - Ps 34:3 exalt His name), and (3) height symbolic of negative notions (arrogance & pride). The OT uses ruwm with positive meaning most frequently of God's being high as in rank (cf 2Sa 22:47; Ps 18:46; Ps 113:4). In the present context while elevation in regard to rank is certainly intended, it also suggests a more literal meaning, implying Isaiah had to look upwards to see the lofty Lord. Spurgeon comments that: the light about Him as a monarch puts on his robe. The conception is sublime: but it makes us feel how altogether inconceivable the personal glory of the Lord must be; if light itself is but His garment and veil, what must be the blazing splendour of His own essential being! We are lost in astonishment, and dare not pry into the mystery lest we be blinded by its insufferable glory. The temple - What Temple? In Jerusalem? In heaven? One cannot be dogmatic (in my opinion). “Holy is God, the Lord of Sabaoth! Seraphim (08314) (seraph [fiery serpent - Nu 21:6, Isa 14:29) is related to the verb sarap = to burn, of literal burning, Lv 4:12, Josh 6:24, Je 7:13, almost always of destructive burning is the plural of seraph (In Hebrew the "-im" ending signifies plurality) literally means burning one, fiery one or glowing one. Seraphim contrary to popular opinion is not a class of angels but a separate class of created beings. They are not "originally mythically conceived with serpents' bodies" as one popular Hebrew lexicon suggests, for they clearly are described with feet, face and wings (no hands described). As Harrison suggests (TWOT) the idea of burning suggest as that "These… beings were brilliant as flaming fire, symbolic of the purity and power of the heavenly court." Faces covered, wings resplendent, Seraphim before Him bow! Angels tremble, martyrs weep, and saints perfected praise Him now! Holy is the angels’ Maker, He who spread His stars in the skies. Holy is the Judge of Creation, all lies bare before His eyes! Woe is me, for I am ruined! For my eyes have seen the King! Robed in righteousness, and holy: Hear the Voice of Judgment ring! All unclean, my lips, my spirit, vile and foul in all I do! All corrupt, my heart within me, wretched, wicked through and through! Every hope I must abandon! Guilty, I await His stroke. Now must come His righteous sentence: Wait! A Bright Form parts the smoke! Bleeding feet stride through the temple! Christ approaches, weeping love! Wounded hands remove my filthiness, God’s caress in every move. Freely righteous! Full atonement! Justified, from sin set free! By the Word of God the Father, I’m declared as pure as HE! At the Cross, His wounds acquit me! Fatal wounds proclaim His praise! And the Empty Tomb sings His glories: Justice is assuaged by Grace! And one called out to another - One to another suggest an antiphony (as when one choir alternates in singing with another). the four living creatures, each one of them having six wings, are full of eyes around and within; and day and night they do not cease to say, “Holy, holy, holy is the Lord God, the Almighty, Who was and Who is and Who is to come.” (Re 4:8-note), contrasting with the thrice repetition of six in the number of the Beast in Rev 13:18-note). Holy (06918) (qadosh) means consecrated, set apart (as dedicated to God), and designates that which is opposite of the common or profane. In the case of God, qadosh describes what He is by His intrinsic nature and as regards man, it refers to those that have been brought into the sphere of the sacred (set apart) by God. As used here, qadosh [holy] signifies the entirety of the divine perfection which separates God from His creation. God's holiness is the keynote of Isaiah's whole prophecies. The LORD of hosts - In Isa 6:1, 8, 11 the divine name is Adonai but the Seraphim acclaim Him as Jehovah Sabaoth, LORD of the armies. Glory (03519)(kabod) means literally to be heavy or weighty (only rarely used literally), the figurative use ("heavy with sin") being more common. From heavy derives the idea of a "weighty" person in society, one who is honorable, impressive, worthy of respect, the meaning in >50% of uses. In the OT glory is a “technical term for God’s manifest presence” (Ex 16:7), often connected with the Shekinah glory cloud (Ex 16:10) and with the Ark of the Covenant. It can also be represented as a consuming fire (Ex 24:17). Glory also involves “honor” or position of power. The glory of the Lord “reveals His person and dignity, and the proper response to such a revelation is to give God honor or glory” (cf Ex 33:18). God's glory is essentially the profound, glowing, visible, confluent expression of the attributes of Deity which bears witness to a still more profound and incomprehensible reality of essence. In His character and essence, He is "Spirit," and thus invisible to man (Jn 4:24), but He has made Himself known to man through revelation by His many names and titles, by His attributes, by His written Word, and finally by His living Word, Jesus Christ (Jn 1:14). In the OT, God revealed His glory at Sinai (Ex 24:16, 17), in the tabernacle (Ex 40:34, 35, 36, 37, 38), in the Jerusalem temple (1Ki 8:10, 11) and here in Isaiah 6 to the prophet. The Septuagint (LXX) translates the Hebrew with the noun doxa [word study], in simple terms means to give a proper opinion or estimate of something and thus the glory of God expresses all that He is in His Being and in His nature, character, power and acts. He is glorified when He is allowed to be seen as He really is. To be where God is will be glory. To be what God intended will be glory. To do what God purposed will be glory. Glory is the sparkling of the Deity… We may see God's glory blazing in the sun and twinkling in the stars (Ps 19:1)… A sight of God's glory humbles. The stars vanish when the sun appears. The whole earth is full of His glory - More literally this reads "The fulness of all the earth is His glory". Vine says it should be rendered "His glory is the fullness of the whole earth". Since God is perfectly holy and heaven is His dwelling place, it follows that heaven must be a holy place where no sin can exist. That’s exactly what the Bible teaches. The prophet Habakkuk says of God, “Your eyes are too pure to look on evil; you cannot tolerate wrong” (Hab. 1:13). Isaiah was given a vision of heaven and of the God of heaven that few others have ever experienced. The prophet’s attention was immediately drawn to the throne where God rules in awe-inspiring majesty and holiness. He saw the angels surrounding the throne who eternally call out the reality of God’s holiness. In fact, over 600 years after Isaiah lived, John heard the same testimony in heaven: “Holy, holy, holy is the Lord God Almighty” (Rev. 4:8). In this heavenly environment of pure holiness, holy people are the only ones who will be at home. Thankfully, through salvation, Jesus Christ clothes us with His holiness so we can stand forgiven and clean in God’s presence. He places His Spirit within us so that Christ is formed in us (Gal. 4:19). We still have to live in a sin-scarred world, of course, and that can wear us down at times. It’s great to realize that in heaven we will finally be free from the presence and power of sin, both our own sin and the evil that surrounds us. Let’s also remember that God made us holy in Jesus Christ not just to prepare us for heaven in the sweet by-and-by, but so we can live above the pull of sin in the mixed-up here-and-now. TODAY ALONG THE WAY- It’s a staggering thought to realize that naturally unholy people like us can look forward to sharing heaven with our sinless God. TODAY IN THE WORD - A. W. Tozer once said the most important thing anyone could know about him was what he believed about God. That's another way of saying that theology matters. What Tozer said about the importance of his view of God can be said about each one of us. What we believe about God is so crucial because everything else in our lives is built on that foundation. If the foundation is shaky, things will start to crumble. As with most of our studies so far this month, we can't summarize everything the Bible teaches about God in a few lines. Isaiah 6 is a good representative because it captures the majesty of God's Person, His perfect holiness and overwhelming presence. Isaiah knew he was standing before an awe-inspiring God when he had his vision in the temple. Missionaries and others who live among various cultures observe that people tend to create and then worship gods whom reflect their own peculiar tendencies. A tribe or village prone to violence invariably creates gods whom they believe delight in violence and blood. This was true in the nations around Israel, as well. That's one reason God commanded the Israelites to eradicate the Canaanites. How different the true God is from one of these created beings. He is so unlike us, so exalted over His creation, that we can't control Him or make Him simply a reflection of ourselves. Isaiah was struck with awe, and even terror, when he saw a vision of God on His throne. The presence of the seraphim and their thunderous voices are a picture of indescribable majesty. The repetition of the word 'holy' speaks of God's perfect holiness His complete purity and separation from anything evil. Isaiah did the same thing we would have done. He cried out in distress, suddenly very aware of his sinfulness. But it was at this point that the character of this terrifying God shined through. Instead of erasing the prophet with a blast of holiness, God sent an angel to cleanse and forgive Isaiah. We don't have to ask Isaiah what he believed about God. The question was what Isaiah's encounter with God did to him. We face the same question because, amazingly, this holy God has said, 'Be holy, because I am holy' (1Pe 1:16). TODAY ALONG THE WAY - Isaiah 6 is not the kind of text we can just read and put down. It seems to demand some reflection. But too many of our schedules allow too little time for reflection and meditation on God and His Word. God Himself tells us, 'Be still, and know that I am God' (Ps. 46:10). Make sure this day includes some time alone with the Lord to thank Him for His holiness, and consider what it means to be holy the way He is holy. Still one of my favorite hymns of all time, and one which has special memories for me. Although I was an unregenerate teenager, this hymn always seemed to strike a peculiar chord in my heart, until one day at age 39 after studying the Minor Prophets, the Holy One of Israel, the Messiah, came to take up residence within my heart and "Holy, Holy, Holy" is even more meaningful. Praise God for godly music which lifts our souls to the throne room of God. The foundations of the thresholds trembled - the bases of the thresholds shook. Compare other allusions to physical manifestations of God's power (Ex 19:18, Acts 4:31). Foundations (0520) ('ammah) usually describes a linear measurement (cf first use Ge 6:15) of a cubit, but here describes a post. Are these the very "gates of heaven" which are caused to shake at the sound of the seraphim? One cannot be dogmatic, but that is certainly a possibility! Trembled (05128) (nua/nuwa) means to move back and forth, to and fro (cf Ex 20:18, 1Sa 1:13). The voice of the seraphim was so powerful that the sound waves caused the temple foundation to sway back and forth, even as mountains tremble when Jehovah appears (Ex 19:18, Jdg 5:4). What an awesome, even fearful experience for God's prophet! In the OT the terms for smoke appear chiefly in three contexts: theophanic portrayals (Ex 4:5, 19:18, 40:38, Ps 104:32, Ps 144:5), descriptions of mundane events whether actual or prophesied, and comparisons or figurative descriptions (eg, anger of God, Ps 74:1, 80:4). Him - Is a collective pronoun which includes the company of the seraphim. Him who called out - One seraphim calling out to another. Perhaps this is a preview of believers calling out to other believers in a symphony of praise to God. Temple (01004) (bayith) describes a fixed, established structure made from some kind of material and in many context (such as the present passage ) bayith refers to the place of worship, the dwelling place (house as it were) of God. At the heart of the idea of a Temple is the abiding presence of God. Although God is omnipresent, He has chosen to manifest His presence in certain locations and at certain times within history. This physical manifestation of God has come to be called the Shekinah. (quoting Arnold Fruchtenbaum's "The Footsteps of Messiah") the Shechinah Glory is the visible manifestation of the presence of God. It is the majestic presence or manifestation of God in which He descends to dwell among men. Whenever the invisible God becomes visible, and whenever the omnipresence of God is localized, this is the Shechinah Glory. The usual title found in Scriptures for the Shechinah Glory is the glory of Jehovah, or the glory of the Lord. The Hebrew form is Kvod Adonai, which means ‘the glory of Jehovah’ and describes what the Shechinah Glory is. The Greek title, Doxa Kurion, is translated as ‘the glory of the Lord.’ Doxa means ‘brightness,’ ‘brilliance,’ or ‘splendor,’ and it depicts how the Shechinah Glory appears. Other titles give it the sense of ‘dwelling,’ which portrays what the Shechinah Glory does. The Hebrew word Shechinah, from the root shachan, means ‘to dwell.’ The Greek word skeinei, which is similar in sound as the Hebrew Shechinah (Greek has no ‘sh’ sound), means ‘to tabernacle.’… In the Old Testament, most of these visible manifestations took the form of light, fire, or cloud, or a combination of these. A new form appears in the New Testament: the Incarnate Word [John 1:14]. 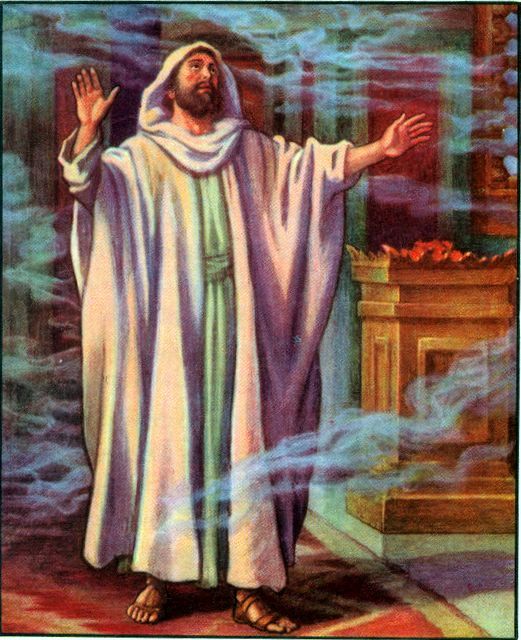 Smoke is sometimes the mere sign of the presence of God, as in Isa 4:5; but more often it indicates his presence in anger or judgment (see Ex 19:18; 20:18; Rev 15:8). Strange that inanimate pillars should thus be moved while the hearts of men remained obdurate and motionless! But one man there was who did respond and that in a very definite way (Ed: Referring of course to the prophet Isaiah, who had ears to hear and eyes to see the supernatural! Lord give us men and women like Isaiah in these "difficult" last days, cf 2Ti 3:1-note). Sinful men with tender hearts rightly respond with a reverent fear and awe when confronted with the manifest presence of the Holy One of Israel. Scripture gives us a number of examples: Abraham (Ge 18:27, 30, 32), Gideon (Jdg 6:21, 22, 23), Manoah and his wife (Jdg 13:20); Job (Job 42:5, 6); Isaiah (Isa 6:5); the apostle John on the isle of Patmos (Rev 1:17). When one is confronted with Jesus, it is impossible to remain neutral. His enemies react to His miracles with hatred and reviling; His true disciples, with homage and reverence. They stoop and worship. TODAY IN THE WORD DEVOTIONAL- According to a report on the history of the automobile, the boom in the fast food industry may be explained largely by the car's entrance into American daily life. The first "carhops" appeared in the 1930s, allowing people to eat without leaving their cars. Then in the 1970s some restaurants tested the idea of "drive-through" service. The new service was a big hit with people who were too busy to park and eat, let alone sit at a table. Drive-through service, cell phones, beepers and other time-saving devices say a lot about a culture that always seems to be in a hurry. Unfortunately, as Dr. Tony Evans points out, this "hurry up and get it" mentality has invaded the church. The result is that many Christians want their worship the way they want their hamburgers. They want to drive up to church, grab an hour of worship, and drive off--what Dr. Evans calls "drive-through worship." Nothing could be more opposed to this mentality than the awe-inspiring heavenly scene before us today. The vision Isaiah saw would bring the busiest "drive-through worshiper" screeching to a halt. In Isaiah 6, the curtain is pulled back on the never-ending worship of God that fills heaven. There is a lot happening in this chapter of Scripture. One purpose of Isaiah's vision was to commission him for service (Isa 6:8-13). Another purpose was to reveal God's holiness and worthiness to be worshiped. Today, we want to step back and take in the incredible scene the prophet describes. We learn much about heaven in these few verses. For instance, God's throne is in the heavenly temple, which, as we will learn later this month, served as the pattern for the earthly temple. We also catch a glimpse of the ceaseless worship that the angels of heaven render to God (Isa 6:3, cf. Rev. 4:8), and we can almost feel the ""doorposts and thresholds"" of the temple shaking. TODAY ALONG THE WAY -Is your worship being offered to God on His terms and timetable, or has it become a "drive-through experience"? Woe is me - It is interesting to note the prophet himself pronounced 6 woes on Israel (Is 5:8, 11, 18, 20, 21, 22 - a different, albeit synonymous Hebrew word [hoy in Isaiah 5, 'oy in Isaiah 6] than that translated "woe" in this verse), but when confronted with the transcendent glory infinite holiness of God, in alarm and despair, he could only cry "woe". Apart from the grace and mercy of God, we would all cry "Woe is me" and it behooves each of us to continually keep this attitude so that we might remain humble and yielded to our great and awesome God (cf Dt 7:21, Neh 1:5, 4:14, Ps 99:3-note, Da 9:4-note). Woe (0188) (oy) is an interjection (a word thrown in between words connected in construction to express emotion or passion) which means alas, which in turn is an exclamation expressive of sorrow, grief, pity, concern, or apprehension of evil. Ruined (01820) (damah) primarily means made to cease, come to one's end, cut off, undone, doomed to die. This was Isaiah's response to a vision of the Thrice Holy God! Damah - 15x in 14v in the NAS - Ps 49:12, 20; Isa 6:5; 15:1; Jer 6:2; 14:17; 47:5; Lam 3:49; Hos 4:5, 6; 10:7, 15; Obad 1:5; Zeph 1:11. NAS = cease(1), completely cut off(1), cut off(2), destroy(1), destroyed(1), perish(2), ruined(5), silenced(1), unceasingly*(1). It is interesting to recall that King Uzziah himself (cf Isa 6:1) had been "cut off" (ruined) after becoming leprous (the discipline of the Lord - 2Chr 26:19, 21) and according to the Mosaic law had to cry "Unclean (tame')! Unclean (tame')!" (Lev 13:45) even as did the prophet Isaiah, who recognized his sinful "leprous like" condition in the face of God's perfect purity. 1Co15:9 (55AD) For I am the least of the apostles, who am not fit to be called an apostle, because I persecuted the church of God. 1Ti 1:15 (63-66AD) It is a trustworthy statement, deserving full acceptance, that Christ Jesus came into the world to save sinners, among whom I am foremost of all. John Murray writes that "The broken spirit and the contrite heart are the abiding marks of the believing soul." The effect of beholding GOD is to make one realize his own unworthiness and the corruption of his own heart. in the light of the Lord's infinite holiness. It is ever thus when man is brought consciously into the presence of GOD. J C Ryle comments on Peter's reaction in Luke 5:8 - We should observe… how much a sense of God’s presence abases man and makes him aware of his sinfulness. We see this strikingly illustrated by Peter’s words when the miraculous catch of fish convinced him that One greater than man was in his boat… In weighing these words of Peter, we must, of course, remember when they were spoken. Peter was at best but a babe in grace, weak in faith, short of experience, and poor in knowledge. At a later time in his life he would doubtless have said, “Stay with me and do not leave me.” Peter’s words exactly express the first feelings a person has when he is brought into close contact with God. The sight of divine greatness and holiness makes him feel his own littleness and sinfulness. Like Israel beneath Mount Sinai, the words of his heart are, “Do not have God speak with us or we will die” (Ex 20:19). Life Application Commentary - Simon (Peter) had seen people cured and had heard Jesus’ teachings, but this miracle reached directly into his life and grabbed him. Simon had been fishing all his life. When he saw what Jesus did in supplying such a huge haul of fish, he recognized Jesus as the Messiah. He had called him “Master” in 5:5, but here he called him Lord… Simon saw no vision; he saw the living Christ. Recognizing Jesus’ identity and thus his inherent holiness made Simon painfully aware of his own sinfulness. J Vernon McGee - When Simon said, “Depart from me; for I am a sinful man. O Lord,” he was saying, “Lord, you called me to be a fisher of men and I failed. I went back to fishing for fish—I thought I knew that kind of fishing better, but I find that I don’t! Depart from me. Let me alone. I am a sinful man. You should find someone upon whom you can depend.” The Lord, however, did not intend to get rid of Simon Peter. He was going to use him, and this applies to us also. All we have to do is recognize that we are not very good fishermen —recognize our failures and faithlessness. When we are willing to depend on Him, He will not put us out of the fishing business, and He will not throw us overboard. He will use us. This is an encouraging truth! R. J. D. Utley - There is also the reassurance that God lives and works with sinful, fallen, marred people (e.g. Moses, David, Apostles). Fallen mankind’s only hope is the gracious character of God and the self-giving work of Christ. D. Bock - What Peter does not realize is that admitting one’s inability and sin is the best prerequisite for service, since then one can depend on God. Peter’s confession becomes his résumé for service. Humility is the elevator to spiritual greatness. Pulpit Commentary - The first effect upon the soul of this vision of God. What usually happens is that the soul is smitten with a sense of its sinfulness, and desires to withdraw from the Divine presence. At this we need not wonder. If conscious ignorance shrinks from great learning, poverty from great wealth, obscurity from high rank, human guilt from human purity, well may the consciously sinful soul of man shrink from the near presence of the thrice-holy God. As Adam and Eve hid themselves when they “heard the voice of the Lord God walking in the garden;” (Ge 3:8, 9, 10)… so do we shrink from the felt presence of the Lord in view of our own unworthiness and guilt. Remembering our spiritual estrangement, our great undischarged indebtedness to God, our impurity of heart in His sight, our manifold transgressions of His righteous law,—our souls tremble before Him; and if we do not say, “Depart from me, O Lord!” as Peter did, yet our first thought is to escape from His felt presence, to put some distance, in thought and feeling, between ourselves and that Holy and Mighty One in whose power we stand so absolutely, and whose Spirit we have grieved so greatly. IVP Commentary - The size of the catch tells Simon and his companions that this event has been no accident. The greatest moment in their fishing career causes them to stop and ponder what God is doing. Jesus has taken Peter’s humble faith and scared him to death with God’s presence. But in the uncertainty that often surrounds faith comes the divine honoring of its presence and a calm voice that says, “Don’t be afraid.” Grace is active. Simon Peter, James and John learn that God will take the faith of humble fishermen and ask them to join him in catching other people for God. Simon Peter represents all disciples. His humility and awareness of his sin do not disqualify him from service; they are the prerequisite for service. Simon’s response recalls the reaction of earlier great servants of God like Isaiah and Jeremiah, who also bowed low in humility when they caught a glimpse of God’s presence (Isa 6; Jer 1:1, 2, 3, 4, 5, 6, 7, 8, 9, 10). Jesus does not call those who think they can help God do his work. God does not need or want servants who think they are doing God a favor. Jesus calls those who know they need to be humble before his power and presence. From now on Simon will be casting his nets in a different sea, the sea of humanity’s need for God. A genuine meeting with Jesus alters one’s perspective. An encounter with God’s power is no reason to draw back from him, but an opportunity to approach him on the right basis, in faith and dependence. In catching fish, Jesus has caught Simon Peter. Unclean lips - The words of one's lips reflect the state of one's heart, for as Jesus said "The mouth speaks out of that which fills the heart." (Mt 12:34). Isaiah saw the pure holiness of God and heard the pure praise from undefiled lips (Seraphim) and realized that his lips which had been contaminated by sin were not worthy to be instruments of perfect praise to the thrice holy God (cf what God will do for men of impure lips in Zeph 3:9). Unclean (02931)(tame) means defiled, rendered foul or dirty, soiled, sullied, impure, polluted. Tame' describes that which has become ceremonially impure by not following the Levitical laws properly or who had come in contact with something that rendered him unclean. Thus it is not surprising that of the 78 uses almost half are found in Leviticus. In short, tame' describes whatever does not suit the presence of the holiness of God. Tame' - 88x in 78v in the NAS - defiled(1), ill(1), unclean(83), unclean thing(1), unclean woman(1), who was unclean(1). Job said that even "the heavens are not pure in His sight" (Job 15:15). Isaiah was God's man before he had this experience, but it still had a tremendous effect on him. The reaction of Isaiah to such a vision is revolutionary. He sees himself as he really is in the presence of God -- undone. It reveals to him his condition. When he had seen God, he could see himself. The problem with many of us today is that we don't walk in the light of the Word of God. If we did, we would see ourselves. That is what John is talking about in the first chapter of his first epistle: "But if we walk in the light, as he is in the light, we have fellowship one with another, and the blood of Jesus Christ his Son cleanseth [keeps on cleansing] us from all sin" (1Jn 1:7). If we walk in the light of His Word, we are going to see exactly what Isaiah saw -- that we are undone and men of unclean lips. You have never really seen the Lord, my friend, if you feel that you are worthy or merit something or have some claim upon God. "I have heard of thee by the hearing of the ear: but now mine eye seeth thee. Wherefore I abhor myself, and repent in dust and ashes" (Job 42:5, 6). If you walk in the light of the Word of God, you will see yourself, and you will know that even as a child of God you need the blood of Jesus Christ to cleanse you from all sin. What an august revelation of the glory of Christ's Godhead was this which broke upon the view of the lowly prophet! How instructive is each particular of His beatific vision! Mark the profound humility of the seraphim-they veiled with their wings their faces and their feet. They were in the presence of Jesus. They saw the King in His beauty, and covered themselves. But the effect of this view of our Lord's divine glory upon the mind of the prophet is still more impressive: "Then said I, Woe is me! For I am undone; because I am a man of unclean lips…for mine eyes have seen the King, the Lord of hosts." What prostrated his soul thus low in the dust? What filled him with this self-abasement? What overwhelmed him with this keen sense of his vileness? Oh, it was the unclouded view he had of the essential glory of the Son of God! And thus will it ever be. The beaming forth of Christ's glory in the soul reveals its hidden evil; the knowledge of this evil lays the believer low before God with the confession, "I abhor myself. Woe is me! For I am undone." Beloved, let this truth be ever present to your mind that as we increasingly see glory in Christ, we shall increasingly see that there is no glory in ourselves. Jesus is the Sun which reveals the pollutions and defilements which are within. The chambers of abomination are all closed until Christ shines in upon the soul. Oh, then it is these deep-seated and long-veiled deformities are revealed; and we, no longer gazing with a complacent eye upon self, sink in the dust before God, overwhelmed with shame, and covered with confusion of face. Holy posture! Blessed spectacle!-a soul prostrate before the glory of the incarnate God! All high and lofty views of its own false glory annihilated by clear and close views of the true glory of Jesus. As when the sun appears, all the lesser lights vanish into darkness, so when Jesus rises in noontide glory upon the soul, all other glory retires, and He alone fixes the eye and fills the mind. "With twain they covered their faces, and with twain they covered their feet." Their own perfections and beauty were not to be seen in the presence of the glory of the Lord. How much more profound should be the humility and self-abasement of man! Have we covered ourselves-not with the pure wings of the holy cherubim, but with sackcloth and ashes before the Lord? Have we sought to veil-not our beauties, for beauty we have none-but our innumerable and flagrant deformities, even the "spots upon our feasts of charity," the sins of our best and holiest things; and, renouncing all self-glory, have we sunk, as into nothing before God? Oh, we are yet strangers to the vision of Christ's glory, if we have not. If the constellation of human gifts and attainments, distinctions and usefulness, on which unsanctified and unmortified self so delights to gaze, have not retired into oblivion, the Sun of Righteousness has yet to rise upon our souls with healing in His wings. Humility and brokenness aren’t very popular in our culture. Although some action heroes show sensitivity, the message of our society is that success demands toughness. But “having your act together” runs contrary to Scripture. Over and over, we see people driven to the Lord in their helpless need. For the past few days, we’ve considered aspects of God’s nature that need to be understood to foster prayer. For the next few days, we’ll consider attitudes of our hearts that open us to prayer. Helplessness is one such attitude. TODAY ALONG THE WAY - Self-sufficiency can be a serious barrier to prayer. Many people take the adage “the Lord helps those who help themselves” to mean that they can never come to the Lord until they have exhausted their own resources. But passivity and helplessness are not the same. Isaiah’s attitude was brokenness in the blinding light of God’s holiness (Isa 6:5). Yet Isaiah’s eager response, “Here I am!” (Isaiah 6:8) reveals how he was actively ready to respond to God. Or consider the woman in today’s reading from Mark. Despite her best efforts to find help, her terrible condition worsened and she desperately sought Jesus (Mk 5:26, 27). Both this woman and Isaiah show the close link between humility, coming helplessly before the Lord, and obedience. Do you ponder your true helplessness and vulnerability apart from Christ? Reflect back on Andrew Murray’s prayer. Then ask the Lord to translate your sense of brokenness into an eager willingness to follow Him more fully. Today in the Word - How did Isaiah respond to this vision? He was immediately and absolutely conscious of his sinfulness. He cried out that he was “ruined” or “undone”. Surely no sinner could see the holy God and live. How did God show mercy to Isaiah? Isaiah was not consumed (cf. Lam 3:22, 23). What’s more, the Lord sent an angel to him with a live, cleansing coal from the altar before His throne. The coal touched his mouth, corresponding to Isaiah’s sense of “unclean lips” and his imminent prophetic calling. He had been eternally transformed! If you feel led to join the hosts of heaven in proclaiming the utter holiness of our God, sing a relevant chorus or hymn, such as “Holy, Holy, Holy,” during your prayer time today (or see the links below). Isaiah 6:6 THEN ONE OF THE SERAPHIM FLEW TO ME WITH A BURNING COAL IN HIS HAND, WHICH HE HAD TAKEN FROM THE ALTAR WITH TONGS. A burning coal - The Seraphim are themselves "burning ones" and here bring a "burning coal". While this may have been a literal coal, it is used symbolically (otherwise it would have literally burned Isaiah) and in the context was God's vehicle for purifying His prophet of his uncleanness. Therefore in this context, symbolic interpretations, such as those quoted below certainly appear to be warranted. The altar - John describes an altar in heaven (Rev 6:9, Rev 8:3), but one cannot state with certainty that that is the same as seen by Isaiah. I believe it would be more accurate to say that this glowing coal is symbolic of none other than the Lord Jesus Christ. He was the One high and lifted up on the throne, and He was the One lifted up on the Cross. It is absolutely essential that He be lifted up, because He came down to this earth and became one of us that He might become "… the Lamb of God, which taketh away the sin of the world" (Jn 1:29). And so the lips of this man Isaiah are cleansed. I take it that this act of putting the coal on his lips was just an external manifestation of what happened in the inner man. It is what proceeds out of the heart of a man that goes through the lips; and, when the lips are cleansed, it means that the heart is cleansed also. the altar of sacrifice, which prefigured the Cross. That live coal told of the fire of judgment having burned itself out upon the offering. The representative of the grace of GOD to needy men flew swiftly to tell of His saving favor, based upon the atoning sacrifice. He touched my mouth with it - Isaiah's mouth was cleansed but represented cleansing of his entire person. Beloved, perhaps it is not your mouth, but your wandering eyes which need to be cleansed of defiling, pornographic images. Acknowledge your "ruined" state and cry out for God's cleansing. Iniquity (05771)('avon) is a verb with the basic meaning of to bend, twist, distort. 'Avon is is a twisting of the standard or deviation from it and thus refers to iniquity, guilt or punishment for guilt. The derivative noun 'awon occurs with only the derived, abstract theological notion of the root: "infraction, crooked behavior, perversion, iniquity, etc." Sin (02403)(chattat/chattath) like it's NT counterpart (hamartia [word study]) means to miss the mark or to fall short of the divine standard. In the majority of cases chatta'ah denotes sins against man, e.g. 1Sa 20:1 Ps 59:3, or against God, mainly in the historical and prophetical literature. Forgiven (KJV = purged) (03722)(kapar related to koper = to cover as in Ge 6:14, ransom, as in Ex 21:30, Nu 35:31, Ps 49:7, an atonement by blood - Lev 17:11) means to atone by offering a substitute. Kaphar includes the ideas of to forgive, be merciful, pacify, pardon, purge (away), put off, reconcile or make reconciliation. Kaphar - 101x in 93v in the NAS - appease(1), appease*(1), atone(3), atoned(2), atonement is made(1), atonement shall be made(1), atonement was made(1), atoning(1), canceled(1), expiation can be made(1), forgave(1), forgive(4), forgiven(5), made atonement(3), make atonement(71), makes atonement(2), making atonement(1), pardon(1). Ge 32:20; Ex 29:33, 36, 37; 30:10, 15f; 32:30; Lev 1:4; 4:20, 26, 31, 35; 5:6, 10, 13, 16, 18; 6:7, 30; 7:7; 8:15, 34; 9:7; 10:17; 12:7f; 14:18, 19, 20, 21, 29, 31, 53; 15:15, 30; 16:6, 10f, 16, 17, 18, 20, 24, 27, 30, 32, 33, 34; 17:11; 19:22; 23:28; Nu 5:8; 6:11; 8:12, 19, 21; 15:25, 28; 16:46f; 25:13; 28:22, 30; 29:5; 31:50; 35:33; Dt 21:8; 32:43; 1Sa 3:14; 2Sa 21:3; 1Chr 6:49; 2Chr 29:24; 30:18; Neh 10:33; Ps 65:3; 78:38; 79:9; Prov 16:6, 14; Isa 6:7; 22:14; 27:9; 28:18; 47:11; Jer 18:23; Ezek 16:63; 43:20, 26; 45:15, 17, 20; Da 9:24. Scofield - Hebrew kaphar means to propitiate, to atone for sin. According to Scripture the sacrifice of the law only covered the offerer's sin and secured the divine forgiveness. The OT sacrifices never removed man's sin because it was "impossible for the blood of bulls and of goats to take away sins" (Heb 10:4-note). The Israelite's offering implied confession of sin and recognized its due penalty as death; and God passed over his sin in anticipation of Christ's sacrifice which did, finally, put away those sins "committed beforehand" [OT times] (Heb 9:15-note, He 9:26-note; Ro 3:25-note). Isaiah confessed in Isa 6:5 ("I am a man of unclean lips") and the faithful God in His boundless mercy provided purification and forgiveness of his whole being (not just from unclean lips but from iniquity and sin). Praise God. Forgiven (03722) (kaphar/kapar) means to cover, to make atonement (to effect a kopher or ransom price, the price that God's justice required), make amends, to pardon, to release. To remove the guilt of a wrongdoing (Ex 29:36). The related word kapporet describes the mercy seat, an "atonement cover", the gold cover on the ark of the covenant where atonement is made. Wycliffe Bible Commentary asks "How could the prophet's impure lips repeat that angelic song? His conscience was burdened by a sense of personal weakness and failure. He could only confess his helplessness and fallen estate. But God's redeeming grace hastened to meet his need, applying to his lips a coal from the incense altar (originally from the altar of blood sacrifice; cf. Lev 16:12). Isaiah was thus cleansed and equipped for praise, intercessory prayer, and the proclamation of God's word. Ironside- The divinely-sent messenger proclaimed the good news of redemption and purification from sin through Him whose one offering was pictured in the sacrifice of the altar. We would re-emphasize the fact that it was from the altar of burnt offering the coal was taken, not from the golden altar, where only incense was burned. That live coal was witness of the fire, ever burning, which was never to go out (Leviticus 6:13). It constantly foreshadowed the work of the Cross. Through that sacrifice alone could iniquity be purged and sin be put away (He 9:13, 14-notes). TODAY IN THE WORD - Have you ever accidentally burned yourself? You might have a vivid childhood memory of reaching out to touch that hot stove Mom warned you against. Perhaps you accidentally stepped on a live coal from your campfire during your last vacation. Maybe at your last backyard barbecue, the wind blew a bit of hot ash from your charcoal grill and singed your skin. Whatever the case, being burned wasn’t a pleasant experience. Given a choice, you certainly wouldn’t repeat it. 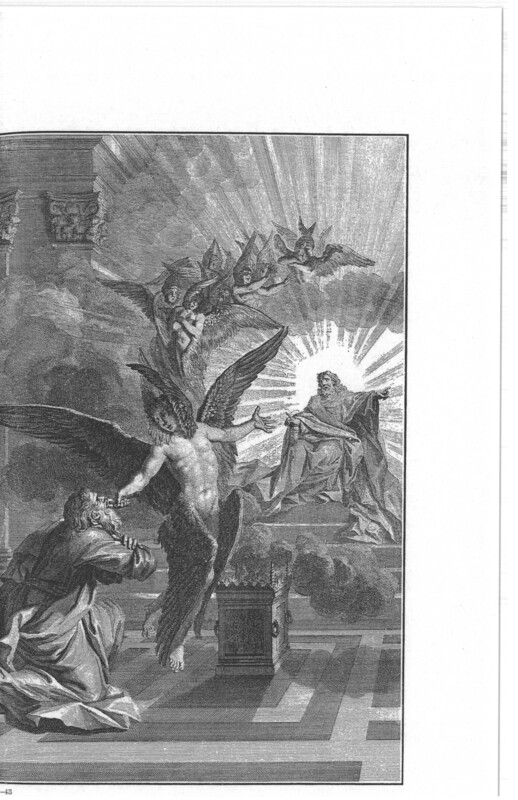 So why in today’s reading does God’s angel touch a burning coal to Isaiah’s lips? It’s a familiar passage, often associated with missions conferences or sermons on God’s holiness, and rightly so. But the topic of forgiveness is also front and center here and deserves our consideration. Over the past few days, we may have given you the idea that forgiveness is only pleasure. Certainly Scripture associates God’s forgiving love with delight, but let’s back up a bit and remember the big picture. Forgiveness follows repentance, but confessing and rooting out sin can be a painful experience. It certainly was for Isaiah. Confronted with a vision of God’s holiness, the future prophet felt crushed with the knowledge of his own sinfulness. He stood condemned and ruined. He saw that he was a sinful man in a sinful community. His focus on “unclean lips” may foreshadow his calling, but more likely signals that he understood how far short his worship fell of God’s worthiness. TODAY IN THE WORD - Visitors to the Mount St. Helens volcano in Washington can now peer directly into the huge crater left by the volcano's deadly eruption on May 18, 1980. A new visitors' center brings the mountain up close, satisfying the curiosity of many who want a firsthand look inside the famous mountain. The volcano has been mostly in-active since 1986, and scientists see little danger of another eruption any time soon. No doubt visitors to Mount St. Helens will gasp as they look into a crater almost two miles wide. They are likely to stare, take pictures, buy postcards, and go home with another vacation memory. But what would happen if a human being were to look on the eternal God? The Bible tells us that no one can see God and live, so awesome is His presence. But the prophet Isaiah came as close to seeing God as anybody in the biblical record. In a vision, Isaiah saw God's holiness and glory, and he was utterly overwhelmed. This well-known passage teaches us a lot about the God we worship and the ministry of worship itself. Evidently Isaiah was in the temple in Jerusalem when he had this awe-inspiring vision of God's throne (Isa 6:1). The description of God leaves no doubt that Isaiah was dealing with the Lord of heaven and earth. These verses give us a vivid word picture of God's majesty and glory. He is the eternally holy God, worthy of the adoration of angels who minister to Him in unending worship (v. 3, see also Rev. 4:8). Isaiah 6:8 THEN I HEARD THE VOICE OF THE LORD, SAYING, "WHOM SHALL I SEND, AND WHO WILL GO FOR US?" THEN I SAID, HERE AM I. SEND ME! Then I heard - When is "then"? When he was cleansed from his sin. Now Isaiah is fit for holy service for he has been cleansed, set apart, and made useful to Adonai for His good work. Beloved, is there not a powerful principle here? When our heart is "filled" with unconfessed sins, surely our ears are "stopped" to God's still small voice! How is your "spiritual" hearing? The voice of the Lord - Isaiah opens this chapter by seeing Adonai from a distance but after confession and cleansing he is now able to hear Adonai. Is there not a principle here for believers today? The voice of the Lord - The voice of Adonai, the supreme, sovereign God, the owner of everything, the Master and here Isaiah's Master. Isaiah has been cleansed and is now ready to hear and heed the call of Adonai. For us (cf Ge 1:26, Ge 3:22, Ge 11:7) - First we observe the singular pronoun "I", followed by the plural pronoun "us" which is at least suggestive/supportive of the doctrine of the Trinity (tri-unity) of God. The plural pronoun ("us") refers to the Lord, the seraphs, and the rest of the heavenly assembly. Then I said - Isaiah responds with no apparent hesitation. How do I respond when I "hear" the Master's voice (especially in His Word) commanding a certain response? Delayed obedience is disobedience beloved! 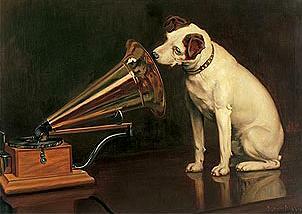 We need to be like the vintage RCA dog and "tilt our ears" when we hear the Master's voice! McGee - Isaiah heard God's call for the first time and responded to it, as a cleansed individual will do. There are too many people today who are asked to do something in the church who first of all ought to get cleansed and straightened out with the Lord. They need to have their lips touched with a living coal. They need to confess the sins in their lives, because their service will be sterile and frustrating until that takes place. Wiersbe - He did not discuss his call with the Lord, as did Moses (Ex 3:11-4:15) and Jeremiah (Jer 1:4, 5, 6, 7, 8, 9, 10), but accepted the appointment and made himself available to his Master. It has pleased GOD to commit the declaration of His truth to men rather than to angels. He is still calling for consecrated men and women to carry the offer of salvation and the warning of judgment to a lost world. Such must know for themselves the cleansing power of the blood of CHRIST if they would give effective testimony to those still in their sins. He said - Who? Adonai, the Master commands. What the Master commands of His bond-servants, He always enables. Given the solemnity and "heaviness" of the message, Isaiah would need all the divine enablement he could get, especially in view of the fact that the prophet is forewarned that his mission would be (in one sense) an abysmal "failure"! Isaiah would convey God's offer of the opportunity of faith, but the very offer would make the recipients even more obstinate! If you ever begin to think God has given you a difficult ministry, take time to meditate on the ministry of Isaiah. The immutable principle is that persistent unbelief will eventually produce a hardened heart that becomes progressively more impenetrable over time! Go and tell - Beloved, these two commands should greatly encourage us because they show that although we, like Isaiah, are men and women of unclean lips, the thrice Holy God is ever willing to use vessels who are willing to be used for His holy purposes (cp 2Ti 2:21-note, Jer 15:19). Simply amazing… amazing grace! This people (same phrase Isa 6:10, 8:11, 12, 9:16, 28:11, 14, 29:13, 14) - The phrase "this people" rather than "My people" seems to convey a sense of contempt with a clear implication that God sees Judah's unbelief and unclean lips (Read Je 7:4, 5,6,7, 8, 9, 10, 11)! (cf Ex. 32:9, 21, 31; Nu 11:11, 12, 13, 14). This people in context is a reference primarily to the people Judah and Jerusalem (Isa 1:1), a people of unclean lips! Keep on listening… do not perceive… keep on looking… do not understand - Can you imagine Isaiah's first reaction upon hearing these words he was to speak to the people of Judah - to say they are not seeker friendly would be an understatement! In fact, almost any one (including believers) upon hearing these words would surely think these do not sound like words from a God of grace and mercy Who is relentlessly seeking to save sinners. The following section gives some insight into these somewhat difficult to understand commands which Isaiah was to go and tell. In a word, Isaiah 6 shows that unbelief is the result of rejection of the light that is given, and that the rejection of the light in turn, in accord with the sovereign decree of God, gradually makes belief impossible. Woe! But note that even in the face of Judah's steadfast unbelief by the majority of souls, there is Isaiah, a picture of the remnant, those who see and are convicted by the light, who confess sin and who receive redemption from the Redeemer! Praise God! Isaiah 6:9,10 has been the subject of much debate and speculation because instead of calling his readers to repent and to not harden their hearts, these verses command Isaiah to issue a proclamation which is just the opposite! Remembering that the best commentary on Scripture is Scripture, it behooves the sincere student of God's Word to try and discern a similar action elsewhere in the Scriptures. In Exodus we see how Pharaoh's decision to harden his heart was followed later by Divine hardening. Ten times the Scripture records that Pharaoh hardened his own heart (Ex 7:13, 14, 22; 8:15, 19, 32; 9:7, 34, 35; 13:15), and ten times it records God's hardening of Pharaoh's heart (Ex 4:21; 7:3; 9:12; 10:1, 20, 27; 11:10; 14:4, 8, 17). This sovereign act of God, designed to make His power known (Ro 9:17-note) might seem cruel except that Pharaoh volitionally hardened his own heart against God (Ex 8:15), and so fully merited God's judgment. Here is an example of the great mystery, inscrutable to our finite minds, of God's election versus man's will. Like two sides of the same coin, both are real but can only be viewed and pondered separately. Neither can be discarded. Paul uses this as an example of the inscrutable will of God and of His mercy toward men (Ro 9:14, 15, 16, 17, 18-note). In sum, Pharaoh hardened his own heart before God hardened it, though the prediction that God would do so preceded Pharaoh's choice. So even as Moses' ministry to Pharaoh resulted in hardening of his heart rather than repentance, in a similar fashion Isaiah's prophetic ministry to Judah would (sadly) result in increased hardening of his hearer's hearts. Matthew Henry (concise commentary) has a balanced comment noting that "God sends Isaiah to foretell the ruin of His people. Many hear the sound of God's word, but do not feel the power of it. God sometimes, in righteous judgment, gives men up to blindness of mind, because they will not receive the truth in the love of it (see 2Thes above). But no humble inquirer after Christ, need to fear this awful doom, which is a spiritual judgment on those who will still hold fast their sins. Let every one pray for the enlightening of the Holy Spirit, that he may perceive how precious are the Divine mercies, by which alone we are secured against this dreadful danger. Yet the Lord would preserve a remnant, like the tenth, holy to him. "You continually hear, but don't understand; you continually see, but don't perceive." "Otherwise they might see with their eyes, hear with their ears, understand with their mind, repent, and be restored, and they certainly wouldn't want that, would they?" "Otherwise they might…repent, and be restored, and they certainly wouldn't want that, would they? Besides, it's too late for that!" "Your preaching will desensitize the minds of these people, make their hearing dull, and blind their eyes." From the outset the Lord might as well command Isaiah to harden the people, because his preaching will end up having that effect. Despite the use of irony, we should still view this as a genuine, albeit indirect, act of divine hardening. After all, God did not have to send Isaiah. By sending him, He drives the sinful people further from Him, for Isaiah's preaching, which focuses on the LORD's covenantal demands and impending judgment upon covenantal rebellion, forces the people to confront their sin and then continues to desensitize them as they respond negatively to the message. As in the case of Pharaoh, Yahweh's hardening is not arbitrarily imposed on a righteous or even morally neutral object. Rather His hardening is an element of His righteous judgment on recalcitrant sinners. Ironically, Israel's rejection of prophetic preaching in turn expedites disciplinary punishment, and brings the battered people to a point where they might be ready for reconciliation. The prophesied judgment (cf. Isa 6:11-13) was fulfilled by 701 B.C. when the Assyrians devastated the land (a situation presupposed by Isa 1:2-20; see especially Isa 6:4-9). At that time the divine hardening had run its course and Isaiah is able to issue an ultimatum (Isa 1:19, 20-note, one which Hezekiah apparently took to heart, resulting in the sparing of Jerusalem (see Isa 36-39) and cf. Jer 26:18,19 with Mic 3:12). I know you will apply hard to German, but do not forget the culture of the inner man—I mean of the heart. How diligently the cavalry officer keeps his saber clean and sharp; every stain he rubs off with the greatest care. Remember you are God’s sword, His instrument—I trust, a chosen vessel unto Him to bear His name. In great measure, according to the purity and perfection of the instrument, will be the success. And when He (Jesus) had finished speaking, He said to Simon, "Put out into the deep water and let down your nets for a catch." And Simon answered and said, "Master, we worked hard all night and caught nothing, but at Your bidding I will let down the nets." "Depart from me, for I am a sinful man, O Lord!" Observe that Peter like Isaiah recognized his personal sinfulness in the presence of Messiah's perfect holiness. And similar to the LORD in Isaiah 6, Jesus (Who in fact I believe is also Jehovah of Isaiah 6) gives Peter, James and John a commission to be "catching men" to which they responded to the Lord's call/commission (much like Isaiah) by leaving everything and following Him. Isaiah sadly unlike the disciples did not receive a promise of procuring men but rather a promise of reproving men because of their rejection of Truth. THE PENALTY FOR REJECTING GOD'S WORD! Render… insensitive - Literally, this reads "Declare fat the heart". These are frightening words to me, for my heart too often "prone to wander, Lord I feel it", and it always crosses my mind that God might do just this to my heart! He might allow me to have what I want. This is a frightful state. I realize that in this context this people represents unbelievers in Judah whose minds have been deceived and whose hearts have become hardened by continual rebellion to God's warnings. God is no respecter of persons, and He will not hold back His hand of just discipline for His children. So let us all beware, lest our hearts should be hardened by the deceitfulness of sin (cf Heb 3:13-note). Shamen/saman - 4v in the NAS - Deut 32:15; Neh 9:25; Isa 6:10; Jer 5:28. NAS = fat(1), grew fat(2), grown fat(1), insensitive(1), render(1). This verse is a classic example of a chiasmus in which there is an inversion in the second set of phrases of the order of similar words in the first section. In other words - heart… ears… eyes… see with their eyes… hear with their ears… understand with their hearts. Hearts… insensitive… understand - So they cannot understand God's message. Ears dull… hear - So they cannot hear God's message. Eyes dim… see - So they cannot perceive God's message. In this verse God is describing to Isaiah the "fruit" of his proclamation - insensitive hearts, dull ears, and dim eyes! Stated another way, God is telling Isaiah that he would be the instrument of Judah's divinely appointed judicial hardening and spiritual blindness! God's command to preach the truth was in effect His command to harden and blind Judah! Woe! Criswell explains that "God in His omniscience knew in advance that the nation would not respond but would remain indifferent and unrepentant, and thus would become hardened. The judgment on the nation Israel did not preclude the repentance of a remnant (cf. Isa 11:11, 12-note). What the hardening is. Sin carries with it its own consequences so that rejection of God itself produces insensitivity to God. It becomes clear that the nation has hardened itself so that they have passed the point of repentance and response to God. Their choice of sin and disobedience was settled and therefore “God gave them up” (Ro 1:24, 26, 28). This generation is being confirmed in its rebellion and will not be given another chance. God will destroy it (Is 6:11, 12) and therefore judicially blinds them to further light. The thought of Isa 6:9, 10 is complex and must be viewed from different aspects. The main thought is that of the hardness and blindness of the nation. On the one hand this is the fruit of their own depravity. On the other it is the execution of God’s righteous judgment. In addition Isaiah is the agent in achieving this effect. A final question which needs to be answered is why Isaiah was to preach and call the nation to repentance which was already judicially blind. At least two reasons may be given. One is that the judgment of blindness over the nation as a whole did not preclude the salvation of individuals. Even today while Israel as a nation is blinded (2 Cor. 3:15), God is still saving individuals (Rom. 11:1). These individuals who would be saved through Isaiah’s ministry are the basis for the remnant of verse 13. Comment: God considers Isaiah 6:9, 10 so significant that they are quoted no less than six times in the NT (Mt 13:14, 15; Mk 4:12; Lk 8:10; Jn 12:40; Acts 28:25, 26, 27, 28; Ro11:8)! Then - After Isaiah had received the specifics regarding his "difficult" mission. Lord how long (cf similar query of "How long?" in context of judgment - Da 8:13-note, Da 12:6-note) - Isaiah knew that God would not cast off His people forever (cf Ex. 32:9, 10, 11, 12, 13, 14) and so he desires to know how long until the end of the divine judgment? Until - This marks the time of judgment, up to the time it is completed as described (devastated… without inhabitant… without people… utterly desolate). Cities are devastated (laid waste)… without inhabitant… without people… utterly desolate (devastated, wasted) - The immediate fulfillment of this prophecy would be realized in Judah's exile to Babylon who destroyed the cities of the land. Let us not forget that devastation is the bitter but inevitable (Gal 6:7, 8, Hos 8:7) fruit of continual, unrepentant (thus unforgiven) sin (then and now)! Ironside - Even though the Word seemed to have no other effect than to harden them in their sins and rebellion, Isaiah was to proclaim the message faithfully. The servant of GOD is responsible to the Lord Himself. Having received his commission, he is to go forth in the name of the One who sends him, declaring the message committed to him. The results must be left with GOD. Whether men hear or whether they forbear (Ezek 2:3, 4, 5), he who proclaims the Word faithfully has delivered his soul. The Apostle Paul entered into this when he spoke of being a sweet savor of CHRIST unto GOD both in them that are saved and in them that perish (2Co 2:15). GOD is honored when His truth is preached, no matter what attitude the hearers take toward it, and that Word will not return void, but will accomplish the divine purpose (Is 55:11). Faced with the solemn responsibility of proclaiming so unpopular a message, Isaiah cried, "Lord, how long?" It takes special faith and obedience to continue to preach to an unheeding people who are only hardened by the Word instead of being softened by it. The Lord's answer was that the message must be proclaimed until there were none left to hear. The LORD has removed men far away - This phrase is still part of the answer to Isaiah's question "How long? ", and so should be read as "Until… the LORD has removed men far away." While God Himself did not literally do this to Judah, He did use King Nebuchadnezzar to carry out this end of carrying Judah off into exile in Babylon. Removed men far away - This prophecy is spoken in the past tense, as if it had already been fulfilled. God's promises (whether to do good and bad [judgment]) are so certain that Scripture frequently speaks of them as already accomplished. In this verse Isaiah's prophetic warning was given some 150 years in advance of its fulfillment. Isaiah's prophecy was written between 740-680BC and Judah was taken into exile into Babylon in 3 stages, 605BC, 597BC, and 586BC, this last date resulting in the destruction of the Temple and Jerusalem. Beloved, we all do well to ponder the truth that the Lord always fulfills His Word, even though the fulfillment may be long in coming. Yet - A merciful (mercy filled) contrast -- devastation, destruction, exile would come but it would not bring annihilation of Judah. A tenth portion in it - "It" is the land of Judah. In the midst of wrath, God remembers mercy. In the setting of death, God prophesies there will be life. Comment: The prophet Zechariah is speaking of the last days, in that day, Day of the Lord, specifically that segment that is known as the Great Tribulation (Begins - Mt 24:15-note, named - Mt 24:21-note), AKA the Time of Jacob's Distress (Jeremiah 30:7-note) or AKA "a time of distress" (Da 12:1-note). This period of the Day of the Lord corresponds to the last 3.5 years of Daniel's Seventieth Week during which time the Campaign of Armageddon will be waged and be brought to an abrupt termination when the King o kings returns (Rev 19:11-16-note) and defeats all of His and Israel's enemies (Rev 19:17-21-note). Daniel depicts this final destruction of the Gentile nations by Messiah as a Stone (Messiah) that returns to crush Nebuchadnezzar's statue which symbolizes all of the anti-God, anti-Christ nations of the world. After crushing the Gentile kingdoms Messiah establishes His Millennial Kingdom (Da 2:34-35-note, Da 2:44-45-note). God always has a remnant of faithful men and women among the unfaithful majority who chose to rebel rather than return and repent. The concept of a believing remnant of Judah is alluded to again in Isaiah 7:3 where we encounter Isaiah's son whose name Shear-jashub (see ISBE note) means a "remnant shall return". In that passage Isaiah was saying that sin would yield captivity, but that God would bring a Redeemer (cf Isa 7:14). Isaiah has more prophecies about Jesus Christ than any OT prophet. Like a Terebinth (note) or an oak - The tenth which survives the exile is compared to a terebinth or an oak tree. This comparison prepares the reader for an understanding of the truth that even after the tenth has been subjected to burning, a stump will remain and be available to "regrowth". Skinner explains that "As the terebinth and oak when cut down retain the principle of vitality in their roots, which will again spring up into a great tree (cf. Job 14:7ff. ), so the ruined Israel contains the indestructible germ of the future kingdom of God, the “holy seed” is wrapped up in it. Criswell - This verse describes the extent of the destruction as nearly complete. But God is promising that just as a tree may sprout again from a stump, so there will be a remnant of the nation that will survive. It will again be subject to burning - This is a difficult phrase. Although, one should avoid dogmatic interpretation, it seems to predict that the remnant will pass through another "fire", which could refer to further chastisement. Irregardless, the important point is that the "burning" would not result in complete destruction, for God would preserve a holy remnant. Some commentators see this as a prophecy that will ultimately be fulfilled in the time of the Great Tribulation, the time of Jacob's distress, when "Many will be purged, purified and refined" (Da 12:10-note), which will result in 1/3 of the nation of Israel receiving the Messiah as Savior (Zech 13:8, 9). Guzik writes that "The remnant will indeed return (Ed: From Babylonian exile back to Judah), but even the remnant will eventually be judged. Israel was not done being disobedient when the returned from the Babylonian captivity, and God was not done bringing His judgment on a disobedient Israel. (f) give a ray of hope in times of disaster and hopelessness. retribution to those who do not know God and to those who do not obey the gospel of our Lord Jesus. And these will pay the penalty of eternal destruction, away from the presence of the Lord and from the glory of His power (2Th 1:8, 9). The day of grace will end and there will be no more opportunity for salvation for those who have rejected the Lord Jesus. Isaiah, chapter six teaches us that even in this age the day of grace may come to an end for certain individuals. That happened to Israel in Isaiah’s day and to many of the individuals in it. Because of their sin which is presented in the first five chapters, they are judged by God. God “gave them up.” He cut them off from further light. The effect of this was to confirm them in their sin, and therefore confirm them in their lost estate. Are we offended by this? We should only be offended if we are offended by the fact that God is a God who judges sin. This has nothing to do with innocent people being kept from salvation. We may safely say at once that God never harden [sic] hearts that would otherwise be soft, and that owe their hardness to His interposition. He does not blind the eyes of those that would fain see, and apart from His interposition, would see. He, that being often reproved, hardeneth his neck, shall suddenly be destroyed, and that without remedy.